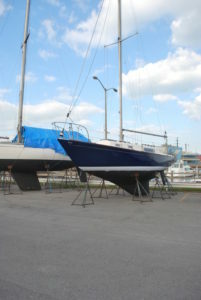 For pure sailing enjoyment and incredible value, simplicity makes good sense. It also makes sense for sailors who remember the thrill of sailing smaller boats. Our only tiller boat, Aquavit is fast, incredibly responsive and thrilling to sail. Riding on the high side at 15 degrees and 15 knots of wind, you feel the pressure on the tiller and wind on your face. Sailing to weather as the breeze picks up, you feel the 5,500 lb. keel taking hold. You’re locking in on a thrilling sail you’ve waited for all week. Sleek, and midnight blue, Aquavit is the smaller sister of Paper Tiger, our larger Charlie Morgan classic. She sails simply, as with smaller boats you’ve loved to sail, but at 33 feet with inboard diesel engine, spacious cabin and stern perch seats in the cockpit, Aquavit offers both greater stability and room to move around. On her Monroe mooring with tiller up, she has cockpit, cabin and deck space to host a Wednesday or Saturday night fireworks party.